Weave Hairstyles – Change Yourself In No Time! Appearance is of great importance for any woman. It is essential for us to look beautiful and trendy. And it’s even more important to have a style that chimes in with our mood, though it may be quite challenging to fulfil this stipulation. Today you may want to have an appearance which is complete opposite to the one you had yesterday. For example, you have recently cut your hair really short, but today you feel like a romantic beauty with long flying curls. Is there any way to solve this vital issue? No doubt there is. All you have to do is to choose one of the many weave hairstyles! Weave Hair – How to Get It? There is no need to explain to a woman what hair extensions are and what they are for. But it may be quite challenging to differentiate between all the hair weaving techniques, as there are really many of them. So, let’s try and figure out what the most popular hair weaving methods are. In all the techniques the described natural extensions may be used as well as synthetic ones. Bonding. It is one of the most wide-spread methods. Here natural hair is separated into several sections and extensions are added to natural hair close to the scalp with the use of glue. With this technique you may add volume or color strips to your hairstyle. Usually additional locks are removed after a few days. Though this style does not last long, it is totally harmless, so you may turn to it as often as you want. Tracking. Here natural hair is braided into several tracks across the head. These tracks are sewn down, and then the extensions are sewn horizontally across the head into braids. Your natural hair should be braided into cornrows around the head or into zig-zag shape, and then the extensions are attached to these tracks from the bottom to the top of the head. Some of the natural hair may be left out, and in this case it is extremely important to do the hair weaving skillfully to make the difference between natural hair and extensions invisible (or almost invisible). This technique requires comprehensive approach anyway. When everything you want to attach to your head is attached, you may have your new hair cut and styled the way you want. Fusion. This technique is famous for its opportunity to achieve a completely natural look of hair extensions. It is rather expensive, time-consuming and may be harmful to your hair, but those who turn to it claim that totally genuine-looking extensions are worth that. The damage may be caused because high heat is applied here, though with due care and precautions this method is safe enough. For it natural hair is separated into several small sections, and new hair is attached to these sections with the help of a heating machine. Netting. This technique allows achieving the longest-lasting results – here extensions may last up to 3 months. It is a perfect solution for those experiencing bolding or hair thinning. 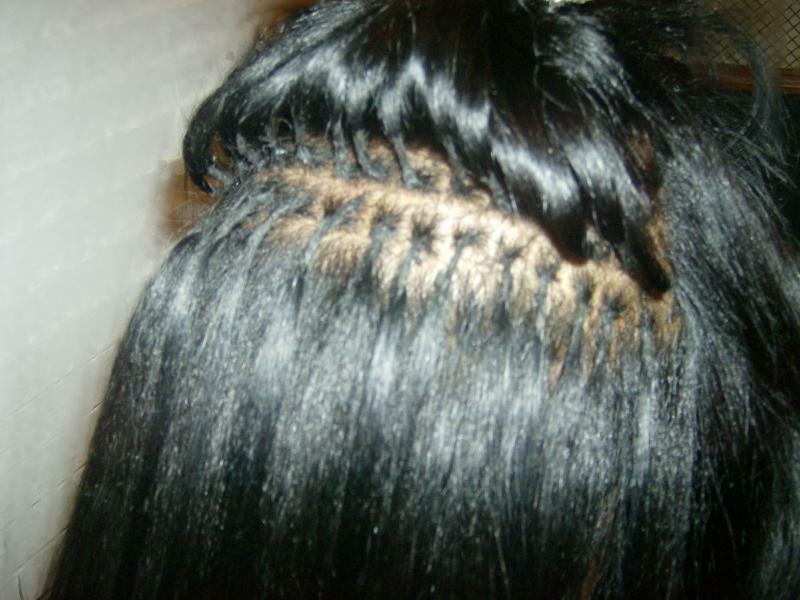 Natural locks are braided and enclosed with a thin film or net, which serves as the surface for the extensions. It is completely harmless to natural hair, and it allows you to wash your hair once a week, provided that you dry it properly. Tree Braiding or Invisible braiding. It is a momentary weaving technique yet with perfect genuine-looking results. First of all, natural hair is parted to create a cornrow braid, and then the extensions are added at the beginning of the cornrow. Clipping. Hair weaves with clips are the “most temporary” ones. Here you have to deal not even with proper hair extensions but with hair accessories. The weaves are attached to clips, and you clip them onto your own hair. This way you can add volume or bright colors to your natural hair. You may wear clips constantly, removing them only when you sleep. It doesn’t pay to save on your beauty. If you can’t afford more expensive techniques, do not get hair weaves at all – ten to one cheap methods and synthetic materials will damage your hair. Get ready! Deep condition your hair and take proper care of it before attaching the weaves: healthy hair will definitely live better through the procedure. No gain with pain. If it hurts considerably, something is done wrong, or the technique you have chosen does not fit you. Anyway, stop the procedure as soon as you start feeling pain. Proper care. Use only those hair care products recommended by the hairdresser and follow all their advice in full. If they recommend that you wash your hair once a week, do wash it once a week More frequent washing will not do you any good. Take a break! Sometimes your hair needs a rest from extensions, so wear it as it is at least for a few days after the hair weaves are removed. By the way, wearing your hair short after weeks of being a long-haired beauty is also a change! Previous post: Rock Your Life With Funky Hairstyles!